Though cacophonous to the uninitiated, there is something joyous in their haphazard sound. The DIY harmonies, lazy fiddle, and fingerpicked guitar magically turn in to something beautiful. Unsurprisingly, Rounder originals hold up as well as any of the warped folk numbers they chose to cover. 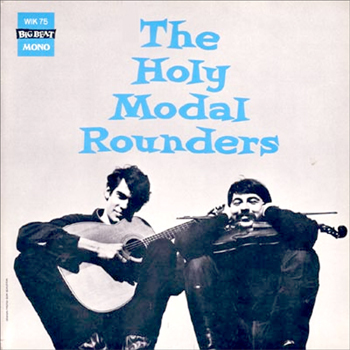 And all their albums have my wholehearted recommendation (especially a very special record featuring the Unholy Modal Rounders, Have Moicy). This past autumn, I went to see the screening of Bound To Lose, a new documentary about the Rounders, where Peter Stampfel (fiddle and high harmony) introduced the film. During his unforgettably eccentric speech, he unhesitatingly claimed that the Rounders had spawned the genre of freak folk. His word is good enough for me, though I can’t think of any competition otherwise. See if you can hear it yourself. Brendan blogs about lost gems and overlooked classics in the genres of Garage, Country, Prog Rock, Psych Folk, and other fringe musical forms at The Rising Storm. He is also a regular contributor to blog collaborative Star Maker Machine.